Hello! It's time for a brand new Mojo Monday sketch (#212).. I hope you will join us this week! Accessories: A Cut Above Dies: Leafy Sprigs, Loopy Blooms (Verve); Long Rectangle Nestabilities (Spellbinders), Scallop Sentiment border punch (Fiskars), Brads, Divine Twine, Charm (CTMH), Felt, Foam tape, Thread, Sewing machine. The felt flower really looks terrific! GORGEOUS card. I LOVE every little thing about it. Super, awesome, great. Must I go on... Ha ha. Great card. I love it. Stephanie what a great card. 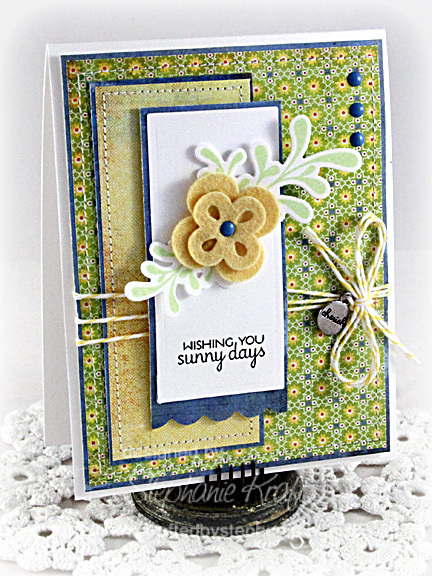 Love the DSP and matching layers and your little beige loopy flowerette. Gorgeous! Such a sweet card Stephanie! Love your selection of patterned paper and that sweet felt flower! Thanks for the inspiration! Great colours and patterns on your papers, and I do like the felt flower and die cut leaves! A lovely cheerful card! this is super sweet, I luv the felt flower...hope you had a great day! This is pretty, pretty, pretty! This is beautiful, I so love that great flower. S pretty, Stephanie! Love how you arranged your focal panel! So very very pretty Steph! Fabulous colours, love the felt flower. Ooo... love the flowers! Those dies are on my wish list! Oh, wow, I LOVE this card! The colors, the patterns, the dishy felt flower--it's just perfect! I think what I love the most is the way the larger flower echoes the tiny flowers in the background. Thanks for the inspiration! Just darling, Steph! Love that little metal charm and your sweet felt flower. love the stacked loopy bloom and your sweet silver cherished charm, everything about your card, including the color choice is charming indeed!